A good air rifle is not mandatory for hunting, target practice, or even getting rid of pests. But if you’re serious about any of the above, choosing the best air rifle is law. Included here are some helpful tips and information as well as reviews of the top 13 air rifles in the industry. Air rifles range from beginner to advanced, and this article will help you choose one that fits your specific category. Air guns fires projectiles using compressed air or gas, whether it is pellets or BB’s. Some models use both types, while more so than not pellets are the main source of ammunition. Air guns represent one of the oldest type of pneumatic technologies, or rather the study and application of pressurized gas to fire projectiles. The oldest air gun in existence is a bellows from 1580, and is stored in the Stockholm Museum. Large strides have been made since then and air guns, or the rifles we will be reviewing, have a variety of flavors and prices available to the typical consumer. Here is narrowed down top 13 list of the best air guns in terms of quality, features and price. 14 Why is it Important to Buy the Best Air Rifle? Crosman is in a league of their own with the introduction of the Benjamin Trail Nitro Piston 2 Air Rifle, a .22 caliber masterpiece with 1200 FPS. For anyone new to Nitro Piston 2, it is Crosman’s evolution of the original Nitro Piston, eliminating all metal to metal contact while adding improvements to reduce vibration as well as cocking effort. The features lean towards use by intermediate to advanced, but as a Nitro Piston variant can definitely be used by beginners for target practice, game hunting, and pest control. Improved air rifle accuracy is achieved without sacrificing the power, and the 8 lbs. weight of the Benjamin Trail Nitro Piston 2 actually helps in some respects rather than hurts when firing. Although a lot of power, the noise suppression is very well done and allows for the air rifle to be used in even the backyard without disturbing neighbors. The length of the 2nd stage trigger is adjustable enough to provide confidence when shooting for long periods of time. The only big complaint about this particular Crosman is the scope, which is not of the highest quality. At about the 10 yard mark, serious adjusting needs to take place in order to secure a target. The scope is easy to replace, and a high quality scope can be fitted with little fuss. For a Nitro Piston 2 model, Crosman did its homework and this is of top quality for shooters of varying levels. 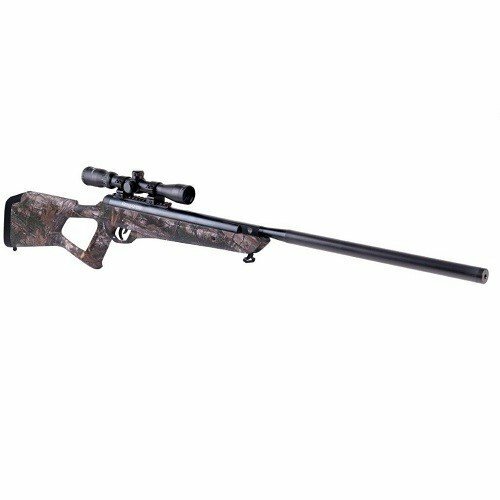 Made for the intermediate user for pest control and small game hunting, the Crosman Nitro Venom Break Barrel Air Rifle is a 0.22 caliber Nitro powered capable of 950 FPS. It is a solid 7 lbs. and is 44.5 ft. in length. A CenterPoint 3-9x32mm precision scope and a quick-lock mounting system is included for ease of use and the ability to scopes quickly and easily. The contours of the air rifle are naturally built for comfort and accuracy, and in combo with the 21 fpe muzzle energy, the overall package is one of comfort and stability. Both the trigger pull and cocking effort require a bit of elbow grease, but it’s more a testament to the sturdiness of the build quality rather than a point lost to the power needed by the user. The break in period is between 100-200 shots, and it gets even quieter than it is out of the box after the break in period, which is truly amazing. User preference, but the crosshairs in the scope are very thick so may prompt some users to change out the scope on opening the box. The Crosman Nitro Venom Break Barrel shows good power from distances as far out as 50 yards. Multiple pellets are usable with this model, with some like the 16 grain pellets being a highly recommended buy. Even using the old Nitro model, the Crosman Nitro Venom Break Barrel is still a good buy for those looking for a good intermediate hunting rifle. The Crosman Optimus Break Barrel Air Rifle has a classic look to go along with its high across the board ratings from most users. Made almost entirely of wood and metal, this .177 calber air rifle clocks in at 1200 FPS and comes loaded with features. Small pests, birds, and target shooting are good uses for this gun in a beginner to intermediate user’s hand. There is a .22 version of this model available for advanced users that packs even more punch. But not to slight the .177 version as there are loads of features in this air rifle, most notably the fiber optic front sight and adjustable rear sight. The cocking force is a good bit, about 25 lbs. worth in this single shooter so many be harder for smaller individuals. As an added safety measure, the Crosman Optimus Break Barrel automatically engages the safety after cocking. Trigger pull has been the only complaint from some users, other than that this rifle scores very highly. Once some adjustments are made, the accuracy and speed combination can’t be beat with the features and price. Although not the best single shooter in the bunch, the Crosman Optimus Break Barrel is more than just looks. Both the .177 and 0.22 caliber Benjamin Titan GP Nitro Piston deliver solid performance with a very comfortable but standard hardwood stock with thumbhole. Aiming for the beginner to intermediate crowd, the Titan does a good job of clearing targets, pests, and small varmints. One thing of note is that this model comes in both GP and NP flavors, so it is a user preference which model one would prefer. With 1200 FPS the power and kickback aren’t bad, but the air gun scope rail grooves may need adjusting, or at worst an adapter to settle it. A minor design flaw that could mess with long term use, it is not a deal breaker. A good solid 31 lbs. of cocking power is required, and is a bit more forgiving after the initial break in. The Titan GP Nitro Piston is pellet friendly and not too picky when it comes to ammo, so accuracy won’t suffer much. Through heavy modification this air rifle can be pretty solid, but so are other variations from the same company without modification. Help guides are online with video describing how to fix the touchy trigger on this model, as well as the aforementioned scope rail grooves. The Benjamin Titan Nitro Piston is not a must have but definitely a solid buy for the power and after a few touchups. The included scope and mount is 4×32 for superior accuracy from this single shot air rifle, although some friendly adjusting may be required. It will be able to dispatch small rodents, birds and other elusive prey with ease. The nicer bells and whistles include a two-stage adjustable trigger, ambidextrous synthetic stock and elasticized lens covers for the scope. The extra bulk of the rifle gives it a good feel in your hands, especially with the aforementioned synthetic stock which is a must due to the cocking effort of 27 lbs. The Tyrant Air Rifle Combo will make a good choice for any collection. Made from the ground up for the beginner, The Swiss Arms 288723 Tac-1 Break Barrel Rifle with scope provides all the features of a higher end model without any of the fuss. Sporting a 432 Swiss Arms Scope the Swiss Arms 288723 delivers good force with accuracy at 1200 FPS. 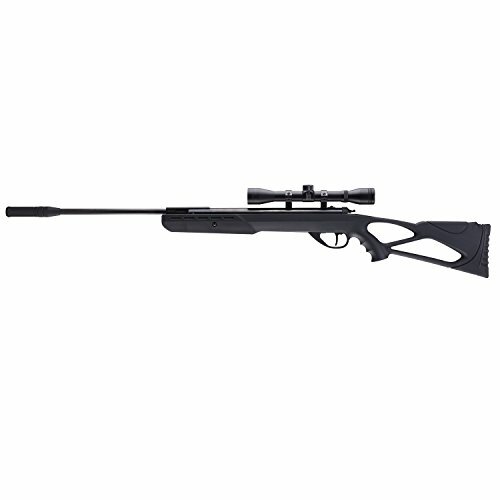 The accuracy of this air rifle reaches over 80 yards without fail, able to knock down small game even in low winds. This air rifle was made for hunting, with the break barrel quality of this model giving some of the best performance of an air gun its size. The 432 Swiss Arms Scope bares second mention, due to the fact that due to its accuracy this air gun would work great in target practice. It lacks some of the nice touches to help with range that a higher end model like the Benjamin Titan XS NitroPiston’s MOA dots supply, but still keeps the bulk of its power even at great distances. On the downside this is one of the louder air rifles on the market, even louder than some .22’s. At a distance it is not as pronounced, but even with the noise reducing spring it makes enough noise for the reducer to not make that much of a difference. For a beginner’s rifle with all of these features, it is a minor quirk in what is an overall excellent beginner purchase. The appropriately named Gamo Hornet Air Rifle is a 0.177 caliber air rifle for hunting and target shooting, with its strength being rooted for intermediates. Sports a 1200 FPS if used with PBA raptor ammunition, fluted polymer jacketed steel barrel, and unique ventilated recoil pad. There are lots of goodies added on to this air rifle, most notably the promotion of the PBA raptor ammunition. The reason this air rifle is meant for intermediates is the lack of an auto safety feature. Instead, the Gamo Hornet Air Rifle depends on manual safety at the discretion of the shooter. The included 4×32 scope with rings is standard fare for air rifles of this type, although the equipment in this area is a bit above normal quality when compared to other scopes in the lineup. A long 18 inch barrel length stands this one out from the pack, and can be the personal preference that makes the purchase worth it. There is enough power in this rifle to kill small game, which is impressive for an air gun of this size and quality. The above average scope is good up to 250 ft. with a little work. For beginners moving on to the intermediate stage, this is the perfect air rifle to break in. The Gamo Hornet is a great deal for the price and for what target demographic it aims for. Having one of the highest FPS at 1250, the Ruger Yukon Air Rifle Combo Gas Piston air rifle is a high quality intermediate to advanced choice from a quality name. There is the 0.22 and 0.177 caliber, with the 0.177 caliber capable of 1250 FPS and unforgiving power. On the quality side of the spectrum is an included 3-9×32 Scope & Mount and Integral Silencer for pitch perfect hunting of game and pests. Measuring at a respectable 44.85 inches, it shoots as well as it looks. 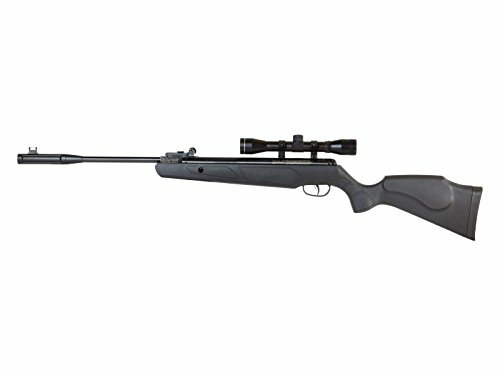 As an upper echelon air rifle, the Ruger Yukon air rifle comes with scope rails. The entry for loading the pellets is a perfect fit, and adds ease of use rather than frustration. There is some kick back to the rifle, and a little bit of weight on the backend so some adjusting is necessary. Not many air rifles come with a silencer that does a great job of noise suppression, but the Ruger Yukon Air Rifle is the exception to the rule. Even with the heavy kickback, this air rifle can be used on multiple fronts and in different situations depending on what the user wants. Ruger without a doubt has made the perfect bridge weapon for any user moving from the intermediate to advanced weapon class. One of the sleekest one shot air rifles in the industry, the Umarex 2251300 Surge Combo includes a 4×32 scope for beginning users as well as hobbyist. At 0.177 this air rifle isn’t hurting for power, and with cocking power at about 30 lbs. is just at the mark before it becomes too strenuous for the beginning user. The scope is easy to manage out of the box, or switch out with a better one if needed. The Uramex isn’t exactly the quietest air rifle, and registers pretty big on the sound scale even after initial shots. Part of the air rifles construction is a rear dove tail mount for changing out compatible optics. There are other intermediate features included like thumbhole stocks, recoil pad, and a nice sturdy and professional feel without the hurting of price. Unfortunately the scope mount brackets are hit and miss, and some users may have problems depending on general use. And even with all of the intermediate features included, it is still a bit underwhelming for what it is meant to do. There are some mechanical issues that may arise after extended use, or even failure. But for an air rifle of this price that can shoot accurately from 40 yards out, the Umarex 2251300 Surge Combo is pretty solid. The Crosman MK-177 Tactical Air Rifle is one of the most cosmetically pleasing air rifles to come into the market in years. The MK-177 gives the user an option of a 5 pellet clip or internal 300+ BB magazine. There is additional space to hold ammo beneath the rubber shoulder friction pad, if needed. The user has the option of adjusting the power through pumps between a minimum of 3 and a maximum of 10. Despite its eye catching design, this is strictly for beginners and hobbyist. The MK-177 FPS maxes out at 800, with the included sights needed serious adjustment before extended use. Definitely not to be used for hunting, it can be used for target practice and pest control at most. There’s 4 slots for magazines, so there is a good amount of ammo that can be carried at one time. Some interesting add ons if users are interested, is that this air rifle works right out of the box with a bipod, without hindering the pumping motion. There is an interesting following behind the Crosman MK-177, with mods popping up all over the internet. It lacks the power, speed, and vision of a real air rifle but it doesn’t stop it from being one of the more popular air rifles among enthusiasts. A high quality adult rifle for advanced hunters, the Benjamin Marauder PCP Air Rifle means business right out of the gate with a sleek black all weather synthetic stock and sizes up to 0.25 caliber. While the 0.25 is an 8 shot repeater, the other models max out at a good 10. Some of the more unique features include an adjustable bolt so you can switch it from the left side to the right side. For more modern users, the service that is required to do that modification can be skipped and done by the user. For those wanting to jump into the PCP world, this is the way to go. PCP air rifles differ from break barrel in that they come pre-charged with air, only using air when shooting rounds. Although a separate pump is needed in order to recharge the rifle, over 20 shots can easily be fired without having to recharge the rifle. Carry along pumps are readily available, with types at the users discretion. Several upgrades have been made to this model, as a factory installed depinger has been added to lower the loudness of the air rifle. The valve for all calibers have been improved, adding extra shots to models having both the green mountain barrel and the Crossman barrel. The entire rifle is mod friendly and has several instructions and videos online due to its small following. Because of that and Benjamin’s outstanding customer support, the Benjamin Maurauder PCP comes highly recommended. The .22 and large versions of the Ruger Air Magnum Combo air rifle shoot 1200 FPS without much fuss. A standard break barrel that includes a 4×32 scope, this Ruger is meant for hobbyists looking for target practice and getting rid of small pests around the house. The Ruger’s 1st and 2nd stage requires little adjusting, and then is ready to go from the start. The actual air rifle itself comes in as one of the heaviest in the market and has a compromising cocking effort nearing 50 lbs. Accuracy is not a strong suit, and trying out different pellets is strongly recommended, preferably heavier ones to improve accuracy at the cost of FPS. The recoil is a killer, and with the extra weight of the gun it will take some getting used to the kickback. The Ruger Air Magnum Combo air rifle is a good buy, but seems to be geared toward the hobbyist. Not as mod friendly as other air rifles, and very particular about the types of pellets it uses. In the long run, when certain conditions are met with pellets and adjustments, some users swear by this air rifle. The Benjamin Titan XS NitroPiston is a mid-advanced air rifle powered by a nitro piston break barrel, and mostly target towards the advanced hunter. The 0.177 caliber Nitro Piston packs a heavy, but quiet punch while shooting at velocities of 1200 FPS. The central point of this air rifles praise is because it produces 70% less noise than spring powered air guns, while adding one of the least noticeable recoils in the industry. Power is also a strongpoint of this air rifle but less touted, even though the Titan X NitroPiston packs 18 lbs. of punch behind its shots. The standard Center-Point 3-9×32 comes with it with MOA dots, a nice touch when hunting for longer periods. The Nitro Piston will be able to take out game on a regular basis with speed, accuracy, stealth and sneaky power. Also works well for target practice, hitting with great voracity easily from 45-50 yards away. The NitroPiston is on the heavy side for a reason, and that reason is because it’s made for advanced level shooters. Modifications to the trigger are easy enough making this air rifle open to other levels as well. With plenty of upside and low downside, Benjamin does it again with the Titan XS NitroPiston. Why is it Important to Buy the Best Air Rifle? You found what fits your needs and is best for yourself or your kid, now ask yourself is it the best of its type? There are many flavors of air rifles available, with small differences that may not seem like a lot at first glance. A small feature like an automatic safety might not be a big deal to an intermediate or advanced user, but to a beginner it could mean the difference between a successful shot and a frustrated user. As there are fewer and fewer quality rifles, the amount of cheap rifles, or for better words ‘cheap crap made for kids’ clutter the market in droves. The best air gun isn’t one that has all of the bells and whistles, but one that has the quality bells and whistles. Be wary of non-named brand air rifles that unfortunately do exist. The great air rifles have a following, with numerous YouTube demonstration videos, how to’s, and support forums with answered questions. The warranty is also iron clad, with some of the top brands spelling it out in plain English a no fuss warranty. The mod community in air rifles is huge, so some of the most popular air rifles are mod ready out of the box, especially with the scopes. Many hunters find the scopes that come with even the great air rifles to be below their current needs, and having the ability to easily swap it out with a higher quality scope is a big plus. The scope removal on the air rifles are no fuss, and with the best scopes costing in the hundreds of dollars, it turns a great air rifle into a super air rifle. If using the air rifle for competition, the competitors are not going to have cheap off brand 0.177 caliber air rifles. The competitors are going to have the best of the best, with thousands of hours put into that same air rifle. To lose a competition because you were the most skilled but didn’t have the best air gun would surely hurt in the long run. Some people buy a low quality air rifle with plans to buy a quality one once they improve. The problem with that is that air rifles require a break in period, some as little as 50 shots, and some as many as 200 shots. Putting in that many repetitions on a lower quality air rifle and then moving to the quality air rifle makes no sense in the long run, especially with the feel being different for each type of air rifle. 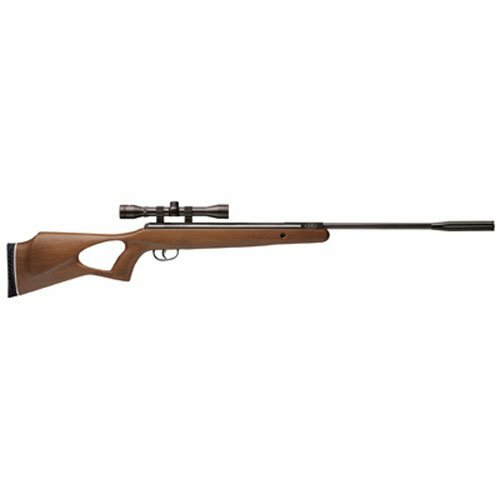 The best bet in the long run is to always go with the air rifle that is high quality, and leave no regrets for later. Besides competitive use air rifles are used to train, hunt and get rid of pests around your land which helps protect it and combined it with the use of a trail camera you can keep watch and keep unwanted visits away from your land. The level of expertise required is dependent on the particular air rifle, but the most known user base are beginners, intermediate, and advanced. Hobbyists can be a gray area, but usually fall within the beginner to intermediate role. When looking for the correct air rifle for your level, you can reference the below guide and match up. The final decision is yours, so happy hunting! The air rifles in this guide have either a 0.177 caliber or 0.22 caliber. The caliber is a good measure of what type of ammo can be fired. 0.177 is the standard and is the most inexpensive to maintain, with low cost light pellets. The 0.177 caliber is the most accurate in long range of the two because of the flat trajectory of the pellets it uses. The 0.177 is mandated for both pistol and rifle competitions by all official shooting organizations, which is something to keep in mind if you’re using your air rifle solely for target practice. Most if not all target guns are this caliber, and with the pellet cost being lower, has a distinct advantage in this field. ISSF (International Shooting Sport Federation) shooting games in the Olympics use this caliber, with President Olegario Vazquez Raña often rounding up millions of dollars in sponsors for participants. Of the most famous shooters that use this the 0.177 caliber in competition, Kamenskiy Sergey from the men’s side and Pejcic Snjezana from the women’s side stand out the most. When you get to the 0.22 caliber deal, then there is talk about taking down larger prey and having more power. With a required large pellet size and more weight, accuracy takes a beating in order to sacrifice for power. This caliber became popular in the mid 1900’s, before being overtaken by the popularity of the 0.177 caliber. It was considered the standard back in the day, as evidenced by the many antique guns that are specific to it. Although shooters can hunt with some 0.177 calibers, it is widely known that for actual game the 0.22 caliber is the way to go, especially if the shooter wants to humanely put down the animal. A 0.177 without enough punch could pass right through the animal because of its small size, a less likely issue with the larger sized 0.22 pellet. The cost of the pellets are higher than their smaller counterpart, and there is also less in the box. Some guns come with both calibers, for a distinct advantage and the best of both worlds. There are several categories of air rifle, each with their own advantages and disadvantages. Manual air rifles are still popular, but the newer precharged types are taking some share away from the old and trusted, at least by a little margin. The multi-pump offers the option of choosing the amount of power, a lot or less, that is desired with each shot. A lot of work goes into the pumping action, which can be a strain on the individual based upon their strength, or even health history. Reloading is obviously slow, and the shooter has to develop a rhythm before getting it to a comfortable level of pumping. The maximum number of pumps is 10, and going over this number can damage the rifle. Over pumping can cause seal damage, rendering the air rifle useless. Break action is a popular type, and involves cocking the rifle, or bending it, in order to load the next shot. Because of the mechanics of this type, they tend to be on the heavier side. It takes a good shooter to handle these types, as the spring that drives the pellet on the inside of the barrel can cause quite the kickback, affecting accuracy as a whole. Break action is also the noisiest of the bunch, but with realistic characteristics that may discipline younger shooters in dealing with heavier firearms. Nitro Piston was created by Crosman in order to alleviate noise, cocking power, and overall weight of the aforementioned break action. The spring is no longer in play when cocking the rifle, but rather a cylinder full of compressed gas powers the rifle. This innovative Crosman feature is labeled as gas piston technology. Disadvantages are after prolonged use, the spring tends to get weaker over time. Which is why the Nitro 2 was introduced to improve on the advantages of the original, and completely eliminates the metal to metal contact. This makes the original breakdown of Nitro powered guns a things of the past. There is a break in period for cocking effort, but is still a lot less than normal break action. PCP allows for rapid firing and nearly no noise, with air only being used when necessary. Basically precharged guns hold air in a reservoir that you pump to get a set amount of shots. The only downside is that you have to manually recharge the pump, which can be a process. If planning to go hunting though, shooters do have the option of bringing a carry along pump to recharge. What’s the point of using an air rifle if you can’t see your target? Air rifles come with a scope, but barring the Benjamin Titan XS NitroPiston’s MOA scope, most are average to above average and require adjusting on arrival. The good news is that most scopes on air rifles were made to be replaced, and there are several outlets online and in store that sell high quality scopes that work across all brands and types. The mod community with air rifles is one of the most respected around, so there will always be someone available to help. Make it a point to put aside 15-20 minutes adjusting the scope, and some may find that a replacement isn’t even necessary. Note: You can also check out our review of the best rifle scope in our scope section. Introducing a child to a gun of any type is a process where the first time is vital. Air guns are no different, and the potential education of use is as important as the actual purchase. There are many safety precautions to take into considering, and as far as purchase, there are even air rifles that don’t support automatic safeties. Air rifles that require manual safety lock exist like the Gamo Hornet, so that is a feature to look out for when purchasing for kids. Cocking effort is not a necessary demon with the innovation of the Crosman Nitro 2, and is completely obliterated with PCP air rifles. So there are options, and even for those hard-nosed dad’s or mom’s that want to teach their kid that nothing comes easy, there are plenty of break barrels with an under 20 lbs. cocking effort. For kids that plan on joining competitions, be wary that some beginning air rifles may be inadequate for competition use. The biggest mistake first time buyers make is choosing an air rifle that ‘looks’ like it will work, or that a friend recommended to them. There are many flavors to choose from, and all of the brand names cater to different personalities. The only wrong choice to be made is one that is not informative. Whether it is children or adults, breaking down the components that are most important to the individual and their goals with their air gun makes for a better purchase. Some simple tips to keep in mind that hunting air rifles are usually in the 0.22 caliber range because of their power, and their ability to not just pass through an animal. This insures the animal is put down humanely, whereas with a 0.177 that isn’t properly powered, could cause unnecessary suffering. The 0.177 is the standard for shooting competitions worldwide, with smaller, lighter and more accurate pellets, Small pests around the house can also be hunted with this caliber, and if properly powered, game as well. With time, research, and the right attitude, finding the perfect air rifle is the easiest part of the game. There you have it, a complete guide to choose the best air rifle with air rifle reviews and more information to get you going with picking the perfect one for your needs. Airriflezone.com is a participant in the Amazon Services LLC Associates Program, an affiliate advertising program designed to provide a means for sites to earn advertising fees by advertising and linking to amazon.com. © Copyright 2017 Air Rifle Zone All Rights Reserved ·.